Five teams take home $100,000 in latest round of ongoing design competition. When astronauts head to Mars in the 2030s, they’ll need a comfy place to stay — and now we have an idea of what their faraway home might look like. 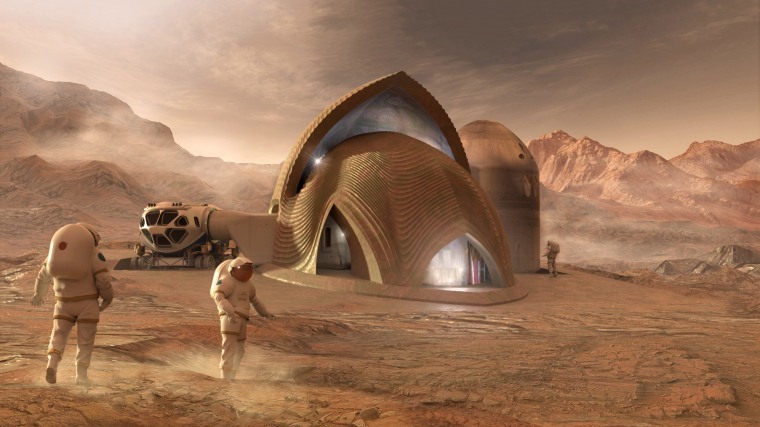 NASA last week announced five winning teams in the latest stage of its ongoing competition to design a habitat for Mars, and the super-realistic renderings range from clustered hexagonal shells to a hat-shaped abode with curving, window-studded walls (see below). The five teams, who shared $100,000 in prize money, were selected from among 18 teams competing in this latest round of NASA's 3D-Printed Habitat Centennial Challenge. All were asked to create virtual models of a habitat where four astronauts could live and work for one year. In partnership with Bradley University of Peoria, Illinois, the space agency asked for designs that 3D-printing robots could make using raw materials found on the red planet. “The teams were given very minimal requirements to allow them as much creativity and innovation as possible,” Monsi Roman, the manager of the competition, told NBC News MACH in an email. First place went to Team Zopherus, a three-man crew from Rogers, Arkansas. The team’s design (above) shows a trio of dome-shaped structures. It includes a hydroponic garden and a large, spiderlike robot that would function as both a lander and a 3D printer. AI. SpaceFactory of New York City took second place with its “Marsha” habitat. It features flexible, hive-like structures designed to expand and contract to withstand temperature and atmospheric fluctuations on Mars. Third place went to the Kahn-Yates team of Jackson, Mississippi. The team’s design shows a hat-shaped habitat dotted with windows that would let in sunlight to allow for gardening. Another team from New York City, SEArch+/APis Cor, took fourth place. Its design shows a habitat with swooping lines and a double-shell exterior intended to protect astronauts from radiation while allowing in natural light. The design, inspired in part by a church in northern Italy, features “light scoops” intended to direct sunlight into the structure while helping keep dangerous radiation out. Northwestern University of Evanston, Illinois took fifth place with its simple dome-shaped habitat with two entrances. The habitat is designed to link to other identical habitats to create a large-scale community. For the next phase of the competition, which ends next spring, NASA is inviting teams to 3D print a scale model of a habitat's foundation. NASA will pick a maximum of 10 winners for that phase of the competition. Will Mars colonists live in these 'Redwood Forest' habitats?